According to ESPN Cricinfo, the visitors were also complicit in their own demise, leaking too many runs in the second half of New Zealand's innings, and later failing to gain any momentum in their chase of 188. In the 10th over, they were 61 for 3 - the required rate already having risen to 12. Batsmen continued to fall as the pressure mounted. The eventual margin of defeat was 47 runs, the last wicket falling in the 19th over. Though the top order paced the innings intelligently, and the quicks were efficient in defence of a big score, it was New Zealand's fielding that truly delighted. Phillips pulled off two outstanding catches from behind the stumps, first tracking a Chris H. Gayle top edge back from his wicket-keeping position to complete a spectacular diving take past the thirty-yard circle. Then later, he flung himself to his right to intercept an edge off Rovman Powell's bat. Debutant Anaru Kitchen also claimed a sharp catch at cover, the ground fielding was athletic, and Phillips completed two stumpings to boot. New Zealand were missing some key players in this XI, but their peerless fielding standards did not dip on account on their absence. There was hope for West Indies in the first few overs of the match. Martin J. Guptill was trapped in front of the stumps by Jerome Taylor in the second over, and Samuel Badree kept the scoring on a leash through the Powerplay. It was not until the eighth over that Munro truly broke free, whipping Kesrick Williams to deep square leg for four, then slamming the two subsequent deliveries for six, in the rough direction of cow corner. With that 19-run over, the innings had come alive. Munro would go in to complete a fifty off 31 deliveries, before eventually being caught by a diving Carlos Brathwaite at long on. The 86-run stand for the second wicket was ended, but Phillips - who had cruised to only 31 off 29 balls at the time, kicked on. He cracked Brathwaite for a six and a four - one boundary either side of the wicket - next over, before meting out punishment even to Badree, who is perhaps the most indomitable operator in the T20 game. Badree did soon have his revenge, however. Having been struck for two fours in the14th over, he dipped a ball past Phillips' defence, and took out the stumps. The remainder of New Zealand's innings was comprised of brief-but-impactful contributions - Ross Taylor hitting 20 off 13 balls, and Mitchell Santner producing 23 off 11. 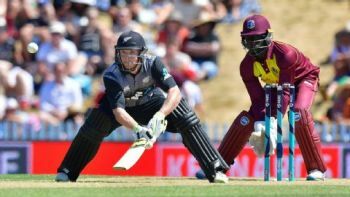 Though the batsmen were clinical, it was Williams' awful final over that propelled New Zealand's total from competitive to commanding. Delivering three no-balls - two for overstepping and one for bowling too many bouncers - Williams also two fours and a six to Santner, giving away 25. Having also bowled the two most-expensive overs in the innings, his figures were 1 for 52. In response, West Indies never really had the measure of this chase. Openers Gayle and Walton fell to successive deliveries from debutant seamer Seth Rance, and though Shai Hope and Andre Fletcher attempted a recovery, they did not score quickly enough to worry the hosts. Fletcher appeared to be warming to his work when he ran down the pitch one too many times at Ish Sodhi, and had the ball slip past his blade. The wickets tumbled quickly after that. Jason Mohammed and Shai Hope were out in the 11th over, bowled by Doug Bracewell. Brathwaite then struck some heavy blows, before he and Powell departed in the same Tim Southee over. With five overs remaining, West Indies were seven down and required 87 - a near impossible requirement. Rance dismissed Badree to end the innings, and collected figures of 3 for 30, which were the best in the match.